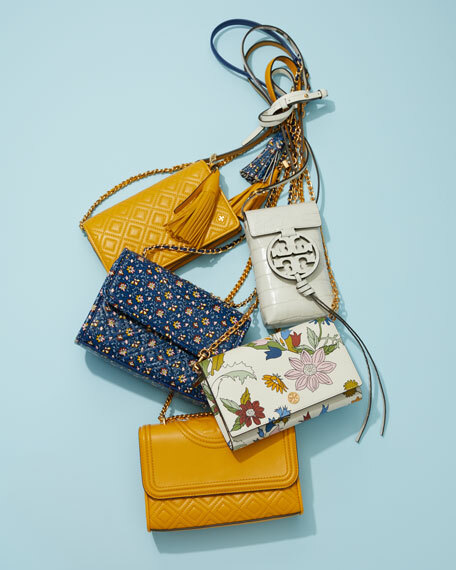 Tory Burch diamond-quilted leather shoulder bag with golden hardware. Sliding, woven chain shoulder strap. Flap top with quilted logo; snap closure. 6"H x 8.4"W x 2.6"D.
Bottega Veneta small box bag in signature intrecciato woven leather. Matte gunmetal hardware. 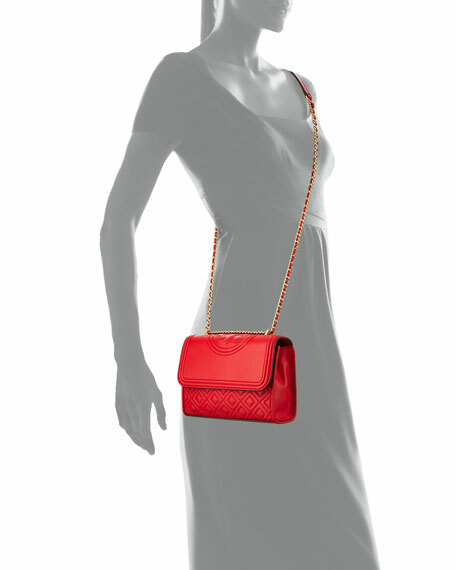 Convertible chain and flat shoulder strap, 21"
Bottega Veneta small box bag in signature intrecciato woven leather. Matte gunmetal hardware. Convertible chain and flat shoulder strap, 21" drop. Two-way zip around closure. Exterior, front zip compartment. Interior, one zip pouch, eight card slots. 4.5"H x 7.5"W x 2.5"D. Made in Italy. Off-White striped saffiano leather bag with black hardware. Removable top handle with cutout detailing, 10" drop. Removable logo nylon shoulder strap, 18" drop. Flap top with magnetic closure. Interior, one slip pocket, one zip pocket. Leashed binder clip detail. 6"H x 7"W x 3"D. Made in Italy. Stella McCartney canvas and faux-leather (polyester/polyurethane) bag with golden hardware. Curb-chain top handle, 3" drop. Removable, adjustable logo shoulder strap, 14" drop. Flap top with snap closure. Exterior, monogram pattern. Interior, one slip pocket. 6"H x 7.5"W x 2.5"D. Made in Italy.